Our article Over and Out referred to ‘a clear-cut lie’ by Eric Schiller and to his ‘mendacity’. The ink was hardly dry before we had occasion to note more of the same, in the form of a grotesque attack on us at his Chesscity website which was flatly untrue, not to say libellous. 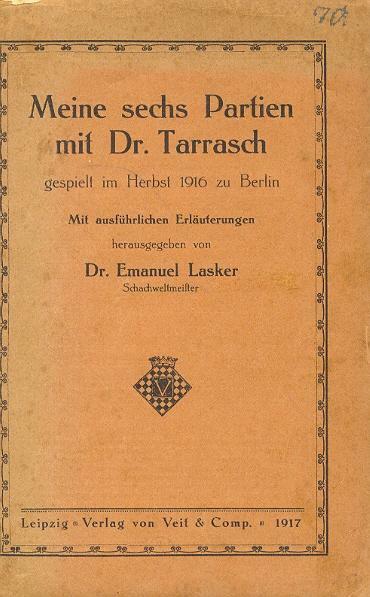 As is well known, Lasker and Tarrasch played two matches, in 1908 and 1916. The first of these was for the world championship, but the second (six games only) was not. Even so, some authors have erroneously indicated that the 1916 encounter was a world title match, two examples being Karpov in Miniatures from the World Champions (Batsford, 1985, pages 43-44) and Koltanowski in With the Chess Masters (Falcon Publishers, 1972, page 48). 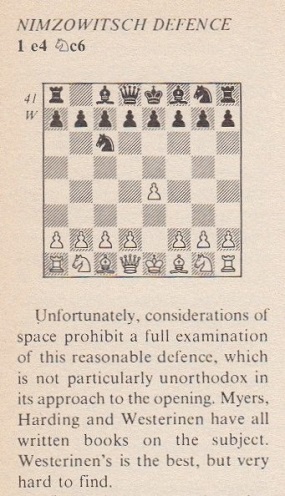 We quoted this in the September-October 1986 issue of Chess Notes and simply added a five-word rhetorical question, ‘When was the second time?’ The item was included on page 160 of our 1996 book Chess Explorations. In short, although we had been referring to the status of the 1916 match, i.e. the (indisputable) fact that it was not for the world title, Schiller falsely and aggressively proclaimed that we were unaware of the very existence of the match. The same day he rewrote bits of his website, maintaining the untruth that we had claimed there had been only one Lasker v Tarrasch match, intensifying his personal attack on us and introducing a fresh charge, equally groundless: now, he added, we were also guilty of ‘sloppiness, poor editing’. To be accused of that by Schiller, of all people, is priceless. It may be recalled that our ‘Over and Out’ article mentioned that Schiller’s books contain ‘hundreds of gross errors’, and we have often quoted chapter and verse. See, for example, the 1999 Kingpin, in which we cited a selection of nearly 40 such instances from three books published by Schiller in 1999 alone. In our book Kings, Commoners and Knaves we pointed out dozens of historical and other blunders in his book World Champion Combinations (in which, for example, the chapter on Capablanca has six games and four positions, with obvious factual gaffes in every single one of them). Our ‘Over and Out’ article also commented on how some writers who are criticized ‘ignore the (unanswerable) facts and pin their hopes on a water-muddying counterattack’, and that is precisely what Schiller has been doing in the present case. He has brushed aside the inconvenient matter of his hundreds of gross errors, trying instead to retaliate via another issue of his own choice, Lasker v Tarrasch. But what do we find? His attempted revenge is based on a distortion of the facts which is brazen even by his own dire standards. And when it blows up in his face, he refuses to correct the record properly or apologize, preferring to launch fresh attacks, also false. Despicable? Of course. Surprising? Not at all. It is vintage Eric Schiller. Afterword: The above statement was first published in 1999 at the Inside Chess website. Below is the text of our Kingpin article referred to. The first is entitled Whiz Kids Teach Chess and contains many infantile errors. For instance: ‘… Black didn’t advance the e-pawn to d5’ (page 24), and ‘When Black advances the d pawn two squares to d6 …’ (page 103). On page 35 we read ‘The armies are at equal strength’, but this refers to a position in which Black is a rook ahead. On page 109 ‘checkmate’ is illustrated by two illegal positions (in the first of which White has no king and in the second of which Black has two). The young reader is also given a little politics. On pages 138 and 140 Schiller goes awry with the French for FIDE, whereas on page 115 he inexplicably refers to ‘the Professional Chess Association (WBCA)’. The book’s prose would be shameful from a 12-year-old, and even the proper use of apostrophes is beyond Schiller. Examples: ‘a normal part of most top young player’s days’ (page 23) and ‘Beginner’s are usually advised to never resign’ (page 121). One final irresistible quote is the typically slipshod reference on page 94: ‘… as Gabe relates (on page whatever)’. Wrong moves: On page 59, after 1 e4 e5 2 f4, Black’s move is given as …Be5, twice. Page 301 has the illegal move Qh4+ instead of Qh6+. The same page claims that in a simple queen ending 3 Qc1 is mate, but it is not. Page 279 has …Qa1 checkmate instead of …Qh1. Wrong history: Page 69 attributes a quote to Tarrasch in 1935, by which time he was already dead. Page 167 claims that in 1895 Lasker was ‘on his way to the World Championship’, but he had won it in 1894. Inscrutable reasoning: Page 82 starts: ‘White offered the initial gambit, but it is Black who holds the extra pawn.’ This refers to a position where White is a pawn ahead. Illiteracy: ‘it is still you’re turn to move’ (page 142). Another example: ‘A passed pawn increases it’s strength …’ (page 250 – in large letters and framed). Bizarre typos: ‘There are of course slow ways of chasing denied away …’ (page 131). From the context, it would seem that ‘chasing the knight away’ was meant. Another example comes on page 145: ‘it can also crate threats’. With all Schiller’s typos, one could pass denied away crating lists. Misspelling of names: ‘Lake Hopatong’ (page 160). ‘Wywill’ (page 297). Wrong diagram: Page 198, for example. Inconsistent spelling: Brinkmate/Brinckmate (page 262). Malteses Cross/Maltese cross (page 280 – with another wrong diagram). Wolf’s/Wolff’s (page 331). The next page has Englisch/English. Nonsensical game-score: Pages 321-322 have a game ‘Pillsbury v Lee, London 1889’. The two did not even meet that year. Ten years later they played a game which opened similarly, but the continuation given by Schiller was in fact what occurred, up to a point, in a different game, Pillsbury v Newman, Philadelphia, 1900. In short, yet another shambles. Inaccurate rating scale: According to the chart on page 408, a typical ‘International Grandmaster’ is likely to have an Elo rating of 2800 (200 points more than ‘World Class Grandmasters’), and the figure given for an International Master is 2000. The third Cardoza washout, World Champion Tactics, was co-written with Leonid Shamkovich, not that that helps. The book has hardly started by the time White is being called ‘Black’ (page 14). On page 55 Kasparov is referred to as ‘Tal’. 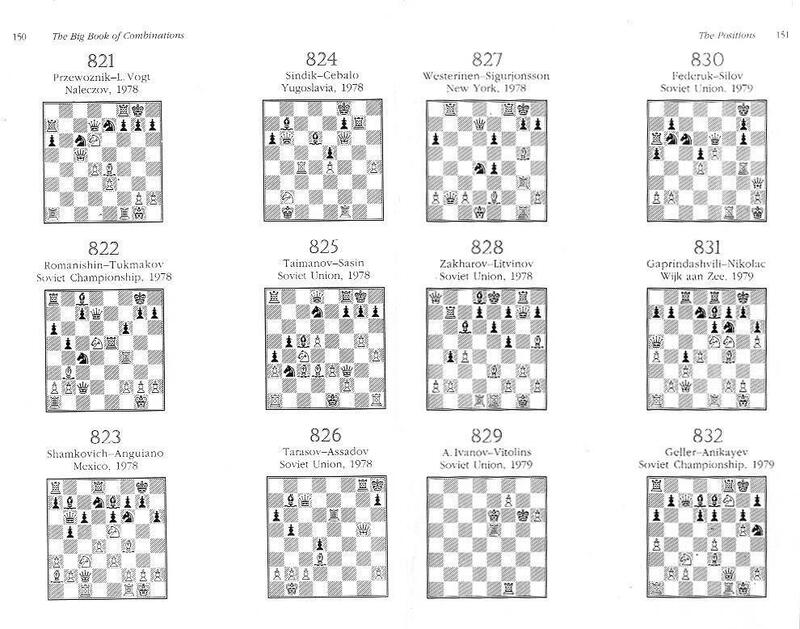 Page 36 has …Qa1 checkmate instead of …Qh1; that is the same mistake as the one mentioned above regarding the Encyclopedia of Chess Wisdom, and indeed the paragraph appears identically in both books. Yet it is not just a question of copying from one book to another. Even within World Champion Tactics there is duplication, such as the Alapin v Alekhine ending on that same page (page 36). It turns up again on page 61 (and both times there is the wrong claim that the event was an ‘international’). Why anybody should wish to buy Schiller’s books is almost as incomprehensible as why anybody should be prepared to sell them. 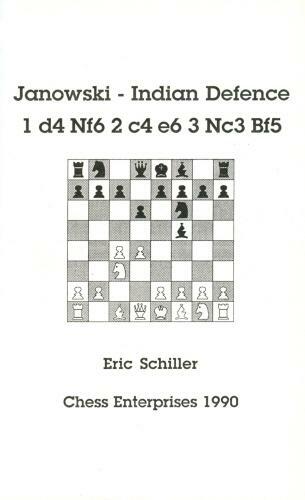 One book we most certainly shall not be reviewing in full is Grüenfeld Defense, Russian Variations by Eric Schiller, published by Chess Enterprises. Grüenfeld is the novel spelling on the front cover. The back cover and spine prefer Gruenfeld. The Preface gives Grünfeld. The bibliography has Bruenfeld. Ah yes, the bibliography, with its reference to the 1946 edition of Modern Chess Openings by ‘Griffith, P.C. & E.W. Sergeant’. P.C. Griffiths cannot be meant, since in 1946 he was not writing, he was being born. Presumably Mr Schiller was not sure whether the co-author was E.G. Sergeant or P.W. Sergeant, so he took one initial from each. Walter Korn’s reaction regarding Modern Chess Openings is available on-line in C.N. 7317. We add just one point. 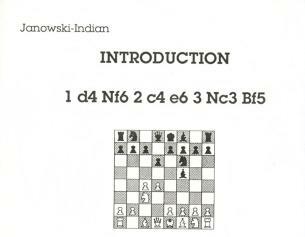 The very first sentence of the book claims that after 1 e4 c5 2 Nf3 Nc6 ‘the move 3 Bb5 was first encountered in official competitions more than 100 years ago in the game Winawer-Steinitz, Paris 1867’. Doesn’t everyone know that 3 Bb5 was a familiar move back in 1851, even being played twice in the London tournament? a) Mr Schiller was the one who opened the correspondence, so he was not replying to ‘loaded questions’ from us. b) Mr Schiller never made any request that the complete texts be published. c) Both of his letters were published in full (our own decision). Mr Schiller’s allegation that we manipulated his letters is so injurious that readers will understand our reasons for taking up two pages to provide incontestable proof that it was an outright lie. We now await from him an unqualified retraction and apology. They never came, of course. 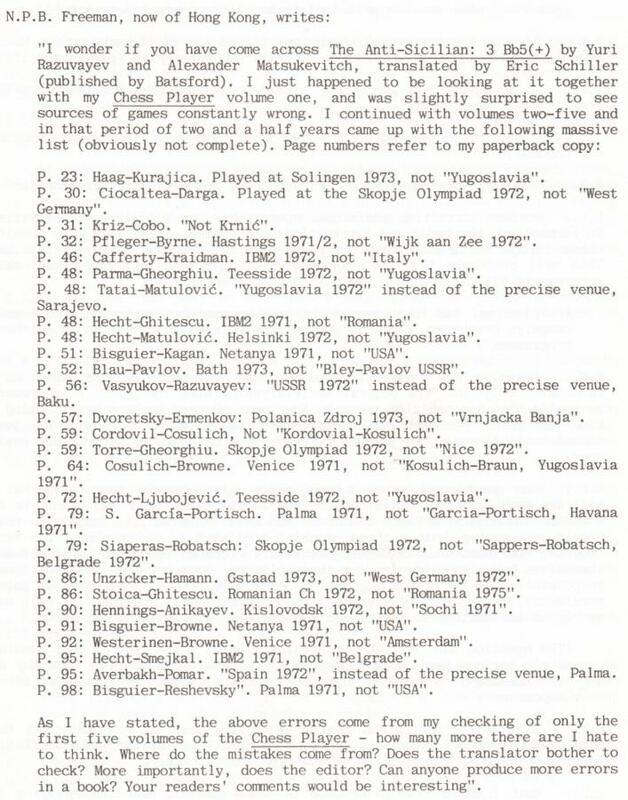 The Encyclopaedia of Chess Middlegames (Chess Informant, Belgrade, 1980) was appropriated by Eric Schiller in his volume The Big Book of Combinations (Hypermodern Press, San Francisco, 1994). It is customary for writers of such works to ‘borrow’ widely from each other, but Schiller went far beyond that. He plundered hundreds (many hundreds) of positions, and gave himself away by indiscriminately repeating countless mistakes from the earlier tome. 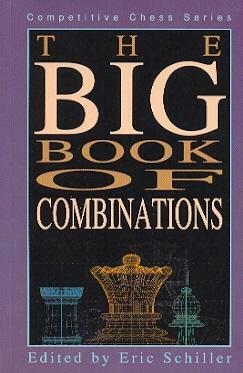 The Big Book of Combinations presents the positions in chronological order, and we opened it, at random, at pages 150-151. Schiller offers 12 positions there from games played in 1978 or 1979. So how many of them had appeared in the Encyclopaedia? Answer: all 12 of them. Moreover, five of the positions are given no venue by Schiller beyond a mere ‘Soviet Union’. Why? Because that is all the Encyclopaedia gave. Clearly, a more extensive spot-check was required. We therefore turned back to page 17, where the twentieth-century positions begin, and went through them until around the end of the Second World War (page 38). That accounted for 132 positions. Astoundingly, it emerged that all but about half a dozen of them had been lifted, without a word of credit, from the Encyclopaedia. Elsewhere in Schiller’s book, we discovered, it was the same story. Realizing that none of the positions from the 1950s had yet been scrutinized, we invited a colleague (who possesses neither book) to pick any year from that decade. He chose 1958, and we duly informed him that a) for that year Schiller gives 13 positions, and b) all 13 had appeared in the Encyclopaedia. On page 200 of the May 1985 BCM we referred to the unreliability of the Encyclopaedia and pointed out, inter alia, that it wrongly gave Capablanca’s game against Fonaroff as played in 1904 instead of 1918, while the Cuban’s win over Mieses was dated 1931 rather than 1913. Schiller, however, was oblivious to all this, and his 1994 ‘effort’ blithely copies these and numerous other mistakes from the Encyclopaedia. For example, the first position from our lengthy spot-check (i.e. on page 17 of Schiller’s book) is labelled ‘Schlechter – Metger, Vienna, 1899’. That is certainly what page 202 of the Encyclopaedia had also stated, but Black in that game (a famous Schlechter win) was Meitner. Indeed, two pages earlier Schiller offered a similar position and mentioned Meitner on that occasion, although the date was given as ‘1889’ and the venue was bafflingly rendered as ‘Bec’. Why? Because Schiller did not realize that Beč means Vienna in Serbo-Croat. Page 183 of Schiller’s book states, ‘In general, we have provided first names or initials only when there might be some question about the identity of the player’, but no such effort has been made. Page 18 has ‘Lasker – Bauer USA, 1908’, i.e. exactly what the Encyclopaedia put on page 251. This leaves the reader to assume that White was Emanuel Lasker, but in reality the position was won by Edward Lasker. (His opponent was Arpad Bauer, and the position was given on page 100 of Deutsches Wochenschach, 15 March 1908.) Of course, Edward Lasker did not visit the USA until well after 1908, but there is a simple explanation. Contrary to the ‘USA’ claim in the Yugoslav book, automatically parroted by the American purloiner, the venue was Berlin, Germany. Page 138 of the Encyclopaedia labelled a position ‘Eliskases – Mori Birmingham 1937’. Schiller (page 34) self-evidently gives the same spelling, unaware that Black was W. Ritson Morry. On the next page Schiller has this caption: ‘Kito – Shelhaut Hastings, 1938’. That, naturally, is identical to what appeared in the Encyclopaedia (page 146), but the players’ names should read Kitto and Schelfhout. 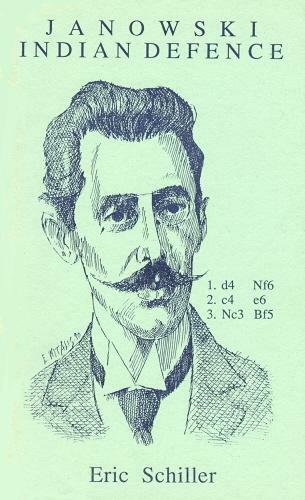 Another 1938 game, on page 249 of the Encyclopaedia, was ‘Tylor – Thomas Bryton 1938’. It may seem obvious that ‘Bryton’ should read Brighton, but it was not obvious enough for Schiller; on page 36 he too uses the spelling ‘Bryton’, adding for good measure an original mistake of his own by changing Tylor to ‘Tyler’. Readers who own the Encyclopaedia of Chess Middlegames and The Big Book of Combinations will see for themselves that the copying perpetrated by Schiller is so extensive that a series of further exposés of his conduct could easily be written, each with a different set of examples. There would certainly be no need for such articles to plagiarize each other. Regarding Tylor v Thomas, Brighton, 1938, see too C.N. 9092. 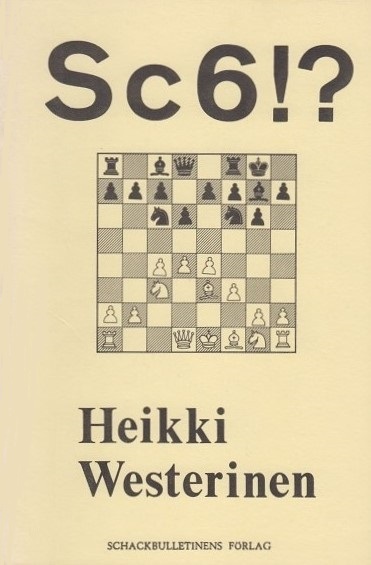 In the January-March 1993 issue of the same magazine, Myers reported that in 1988 Schiller, then temporarily in Hawaii, had insisted that a book on 1 e4 Nc6 by Westerinen did exist, and that a copy was in his library in Chicago. He promised to give Myers further information upon his return home. The remainder of the episode is easily guessed. Schiller kept silent and Myers eventually secured a copy of the book by Westerinen. 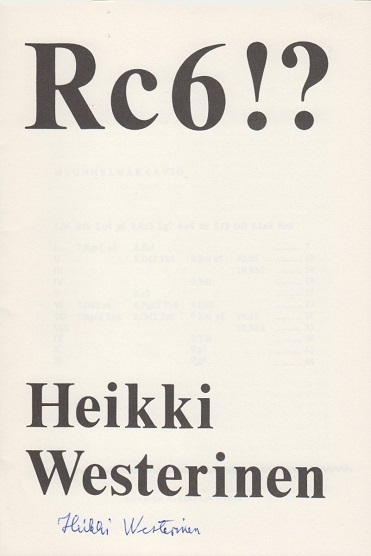 It was published in Swedish in 1972 (also in Finnish the same year, under the title Rc6!?) and dealt only with 1 d4 Nf6 2 c4 g6 3 Nc3 Bg7 4 e4 d6 5 f3 O-O 6 Be3 Nc6. As mentioned on page 294 of Kings, Commoners and Knaves, in 1996 Eric Schiller came out with a volume on Rudolf Spielmann. ‘Rudolf’ appeared on the front cover, but elsewhere (including the title page and back cover) the name was misspelt ‘Rudolph’. A further recent book by Mr Eric Schiller is 100 Awesome Chess Moves, Cardoza Publishing again being the culprit. The illiteracy begins on the front and back covers (‘This collection … are …’). Those unfortunate enough to own a copy are also invited to turn to the ‘Index of Games’ (pages 286-287) and hunt for any correct page references. World Champion Openings by E. Schiller (third edition – Las Vegas, 2009). A few lines later, in all three editions, mention is made of another world championship challenger, Isidore [sic] Gunsburg [sic]. That is what Eric Schiller persistently claims. We drew attention to it in C.N. 2241 (i.e. on page 89 of the 1/1999 New in Chess). Far from correcting his spectacular gaffe, Schiller subsequently posted it at a second website, as we noted in C.N. 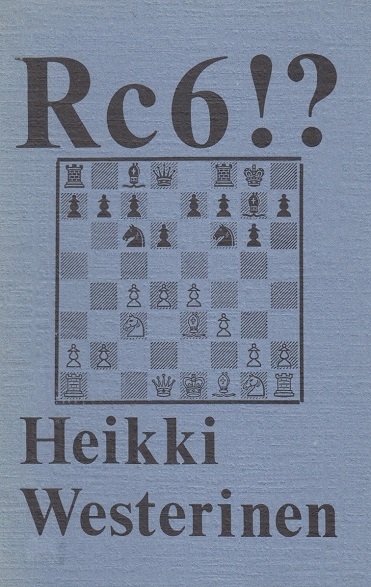 2302 – see page 98 of the 5/1999 New in Chess. Yet even then Schiller refused to make a correction, so in C.N. 2468 (page 105 of the 1/2001 New in Chess) we mentioned the matter a third time. That summary was written in 2004. Today, a dozen years after we first pointed out the spectacular gaffe, the same claim about Steinitz is still on-line, under the title ‘Oldest World Champion’ in a signed article by Schiller at a website which states that it is supervised by him: Chesscity.com. Addition on 5 January 2013: the above link no longer works. ‘An evil man who is not going to be missed. Thoroughly corrupt persecutor of those who wanted chess to move forward. Destroyer of our beloved World Championship. On page 873 of Gyula Breyer. The Chess Revolutionary (Alkmaar, 2017) Jimmy Adams writes that he started the book over 30 years ago. ‘In 1989, I asked my friend Eric Schiller how he manages to write and publish so many books. He explained that he just compiles the information and then inserts simple to understand commentaries with basic tactics to explain the ideas. See too An Alekhine Blindfold Game and Copying. Latest update: 19 November 2017.